Butek Landline manufactures and supplies secondary containment berms and bunds, and installs flexible geomembrane liners for the petrochemical industry. These include the Landflex Elvaloy 90 range of petrochemical, fuel and oil resistant membranes. Landflex Elvaloy 90 is a specially formulated premium grade elvaloy, compounded for extremes of use. 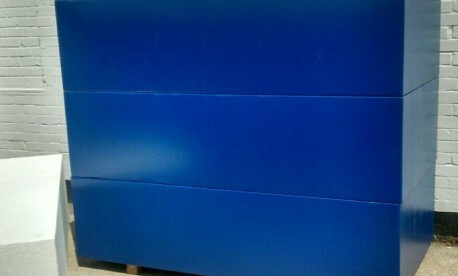 It provides high strength and flexibility, combined with high chemical resistance and long term environmental integrity. We can work on a design and build, partnering, term contract or single contract basis. Butek Landline offers single source responsibility and can provide PI insurance for its design work together with material and installation warranties. 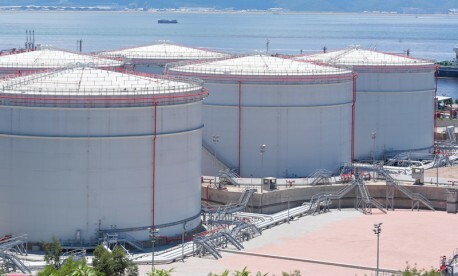 We offer petrochemical lining and secondary containment lining for tank farm bunds and tank underbases. 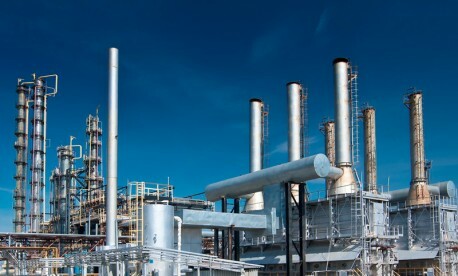 We specialise in working with process engineers, tank constructors and refurbishers, M&E contractors and groundworkers. The company provides quality assured installations in complex situations and can perform repair and extension work to existing site-installed geomembranes. Our skilled site teams can undertake secondary containment lining and underground bund lining for petrol station fuel storage tanks and for garage forecourt areas. We work closely with consultants and architects working in the field of service station and forecourt design to provide a cost-effective installation. We have a range of portable berms manufactured from Landflex Elvaloy 90, with robust tubular steel framework, designed for the safe containment of petrochemicals in drums, bags or bladder tanks. Our Butyl Group Easy-Up Berms are suitable for all climates, are fully reusable, easily transported , and can be deployed by 3 people in less than an hour. 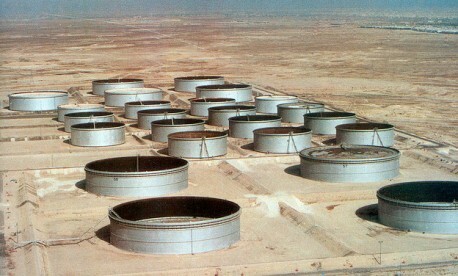 They are also highly suitable for use as secondary containment for stored Agricultural fuel oils. contain every part of the tank or drums, with taps and valves directed down and locked shut when not in use. contain delivery pipes that are permanently attached to the primary tank which must be fitted with self-closing taps or valves and locked inside when not in use. Our material demonstrates high tensile strength, with excellent puncture and hydrostatic resistance. Landflex Elvaloy 90 is suitable for use with diesels, agricultural fuel oils, jet fuels, all petrochemicals and a wide range of acids and alkalis. Providing safe containment for fuel and chemical spillages and runway runoff is vital for the safe operation of airports and military airbases. Butek Landline supplies and installs specialist fuel resistant liners suitable for use with Jet Fuel A1 and Glycol De-icers and can provide engineered solutions for specific applications. 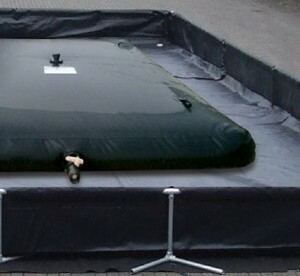 Floating covers may be used on petrochemical or process waste lagoons for eliminating odours, reducing evaporation losses and maintaining temperature stabilisation. 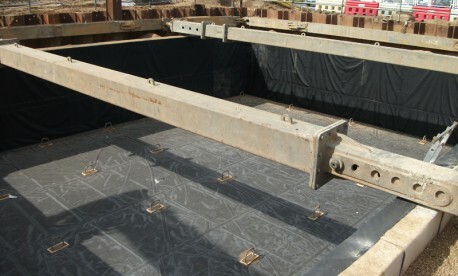 Covers are normally modular in form, enabling panels to be constructed off-site and then assembled on the lagoon base or in certain circumstances, to the in-service tank. The company can line cellular polystyrene blocks with flexible reinforced fuel and oil resistant geomembranes to provide a hydrocarbon resistant close-fitting covering. The blocks may be used for road and rail bridge abutment constructions or in marine floating walkway and offshore applications. A textured variant of the geomembrane is available, which enables improved friction between surfaces. The blocks pictured are being utilised as a flotation aid beneath a pontoon for the RNLI and have been lined using one of our reinforced PVC materials at 0.5mm thickness. We operate a fully documented ISO quality management system with all weld seams inspected and tested. Directly employed, experienced full time, trained construction and installation crews use the latest plant and welding equipment to ensure the projects are completed safely, successfully and in accordance with the demands of the industry. 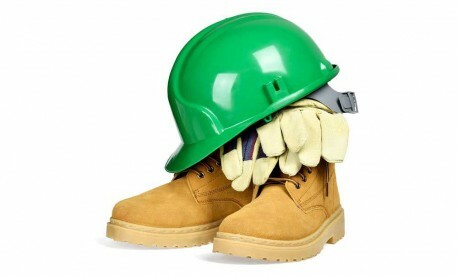 Our highly skilled site teams are TWI (The Welding Institute), CCNSG (Client/Contractors National Safety Group) Safety Passport, PASMA (Prefabricated Access Suppliers’ & Manufacturers’ Association), SSSTS (Site Supervisors Safety Training Scheme) and CSCS (Construction Skills Certification Scheme) certified.